De-bonding of joints of Sheeting Type Membrane. 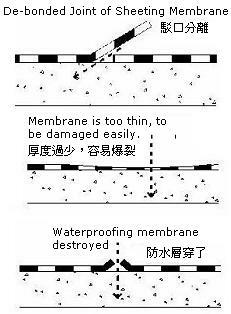 Thickness of liquid applied membrane does not reach quality standard which result in deterioration and peeling off. Remove and cart away existing waterproofing layer and make good surface to receive new waterproofing (one layer C/S screed laid to fall may be required. Apply “Labond Flexcoat W500” Acrylic Copolymer Waterproofing System comprising one priming coat,two acrylic coats and one “MPMESH”polyester mesh layer in between coats onto roof slab and dressing up to skirting and surrounding kerb. Hack off and cart away existing roof tiles , insulstion , screeding and waterproofing membrane on slabs ,including cleaning off and making good surface with “FloorFlat F700r”self level surface to receive new waterproofing system. Hack off and cart away existing rendering, screeding, wire mesh and waterproofing membrane at upstands, skirtings, curbs, etc. Supply and lay “Labond Thanecoat W302”heavy duty waterproofing system comprising two liquid applied polyurethane coating reinforced membrane with non-moving reinforcing mesh. (Thickness not less than 2mm)onto whole roof slab, upstand, skirting, curbs etc. Complete surface water outlets, pipes and penetrations through roof slab with dressing of waterproofing membrane and stainless steel collars where appropriate. Conduct water test on the new waterproofing membrane. Lay 25mm thick cement/sand screed with Zinc coated hazagon steelwire mesh reinforcement with 19mm mesh size to upstand, skirtings and curb. Lay 40mm thick “Styrodur”insulation board or lay “ISOFOR” 50mm min. thick insulation screed to floor. Lay 300Χ300Χ300mm concrete tiles in cement mortar(1:3)on screeded flat roof. All tile joints to be pointed with cement mortar. Form two No.25mm wide expansion joints, at approximately equal spacing longitudinally across the roof, and fill with polyurethane sealant. Replace “domp” type or “box” type gratings at surface water outlets. Theories, method statements and diagrams are intellectual property of Master Proofer Company Ltd. Knowledge receiving from reading of this page are for readers’ personal usage only. Relevant information extracted from this homepage apply for your reports, broadcasting, writings, research must denote that Master Proofer Company Ltd is the source of origin of data.